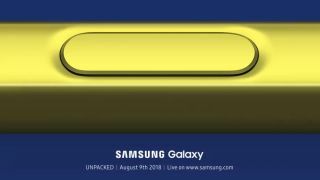 The Samsung Galaxy Note 9 has been officially unveiled on stage in Brooklyn, New York. It's the latest phablet from the South Korean firm, replacing the Galaxy Note 8 and sliding in above the Galaxy S9 and Galaxy S9 Plus. Samsung is billing the Galaxy Note 9 as the most powerful smartphone its ever made, and it comes with a huge 6.4-inch display. There fingerprint scanner has been centered beneath the dual cameras on the rear to make it easier to hit, and there are four colors: Ocean Blue, Lavender Purple, Midnight Black and Metallic Copper. It boasts the biggest battery ever in a Galaxy Note device, and storage starts at 128GB, and it also comes in a 512GB version of the phone. Both variants sport a microSD port, supporting cards up to 512GB - a theoretical 1TB of storage could be on offer.